Traveling can be amazing! But when you don't have the right tools it can become a frustrating and absolute mess. Be sure you have all the tools to travel in the most efficient way possible. This luggage tag will surely be able to get you started in having all the right tools for traveling. 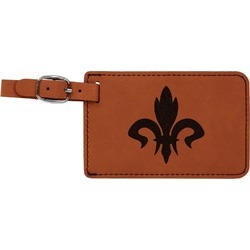 It is made of a beautiful leatherette material that is a nice shade of cognac brown. The front of the tag is where your design goes. The sturdy black stitching gives your design an extra pop and gives the tag extra durability. The back of the tag has a clear vinyl window where you can slip in your address card. The tag comes with a great little buckle strap that you can easily use to clip to your suitcase. 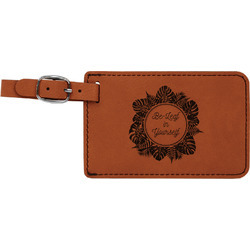 The tag itself measures at approximately 5.5"W x 4.25"H.
To care for your luggage tag, simply dampen a cloth with warm water and a small amount of mild soap. Gently wipe away any dirt and promptly dry with a cloth afterwards. Go through our other luggage tags to find the perfect one for you! Check out our luggage handle covers as well! You may even want a tote or backpack for your carry on as well! Make sure you are completely prepared for your adventures.